The events that occurred along the Jersey shore during a brutally hot summer in July 1916 may have signaled the start of our fascination with - and terror of - sharks. 1Correction. The New York Times. Sept. 8, 2001. http://www.nytimes.com/2001/09/08/nyregion/c-corrections-091162.html?pagewanted=all (Accessed Feb. 22, 2016). Approx. 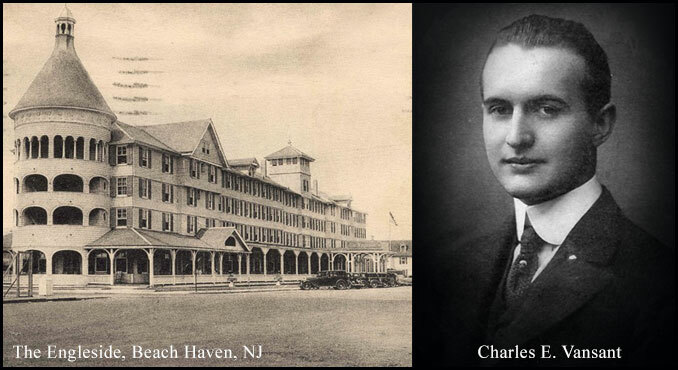 5:00 pm: Charles Epting Vansant arrived in Beach Haven via train from Philadelphia, Pa., with his father and sisters in an attempt to escape the sweltering city heat and celebrate the holiday weekend. While his father and sisters went to the Engleside Hotel to unpack, Charles headed to the beach for a swim before dinner. Charles was a 25-year-old businessman who was known for his athleticism - he was on the golf and baseball teams in college - and outgoing personality. Approx. 6:00 pm: Charles was attacked by a shark approximately 50 yards from shore. Lifeguard Alexander Ott, a member of the 1910 American Olympic swim team, was the first to attempt to rescue Charles from the shark. (Subsequently, he also became the first lifeguard to perform such a duty - rescuing a swimmer from a shark attack - in American history.) It is reported by witnesses that the shark does not release him until he had been dragged by rescuers to water shallow enough for the shark to scrape its belly on the sand. 6:45 pm: Charles had been moved to the Engleside Hotel manager's desk, where he passed away from blood loss. Note: A sea captain witness claims the shark to be a sandpiper shark. 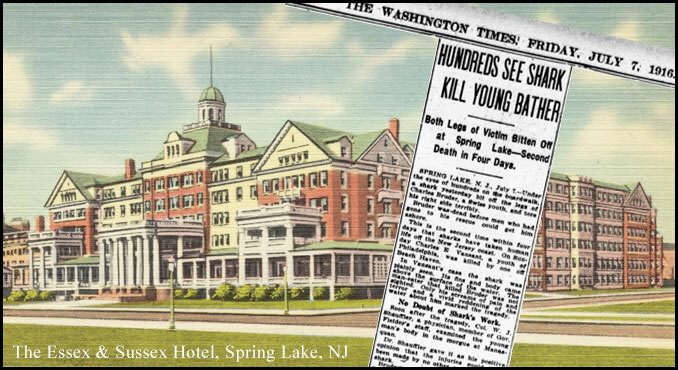 Charles Bruder was a 28-year-old Bell Captain at the Essex and Sussex Hotel in Spring Lake. Originally from Switzerland, Charles was supporting his mother, who was still living in Lucerna, Switzerland. Approx. 1:45 pm: Charles took his lunch break with coworker Henry Nolan and they headed to the beach for their usual lunch-time swim. Approx. 2:15 pm: Charles joined his friends in the surf in the employee section of the beach. A strong swimmer, Charles ventured farther out into the surf. Shortly afterward, he was attacked by a shark approximately 130 yards from shore. Lifeguards Chris Anderson and Capt. George White took a lifeboat out to rescue him and, as they reached him, Charles shouted to them that a shark bit off his legs. They pulled him into the boat and realized that both of his legs appeared to be gone below the knee. Charles passed away from severe blood loss while in the boat on the way to shore. Charles is interred at the Atlantic View Cemetery in Manasquan. A shark is spotted just outside of the swim ropes. The lifeguard captain on duty took a boat out and beat it with an oar to chase it away. It was an allegedly 12-foot shark. The remains of the Wycoff dock along Matawan Creek was a popular swimming spot known for having a deep section, which made it a particularly attractive location for the town's young boys to escape the oppressive heat of the summer (girls would not swim there). Located several miles inland from the ocean, it would have been absolutely unfathomable to Matawan residents that a shark could possibly be in the creek. The temperature that afternoon would reach 96 degrees. That morning, the Coast Guard released a statement that there were "so many sharks [spotted along the shore] that a patrol of cutters would be useless." 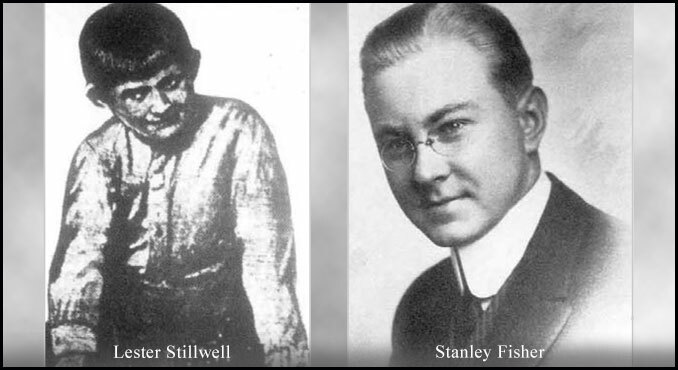 6:30 am: Lester Stillwell left for work with his father at Anderson Basket Factory. Lester's best friend, Albert "Ally" O'Hara, also worked there. Lester was 11 years old and just one week shy of his 12th birthday. He suffered from tonic-clonic seizures due to epilepsy. Approx. 1:30 pm: Capt. Thomas Cottrell, a retired sea captain, was walking back from fishing and while crossing the trolley drawbridge over Matawan Creek, he saw a dark, gray shape approximately 8 feet in length, going west, up the creek, with the incoming tide. He recognized that it was a shark. Four workmen on the bridge at that time also saw it. Capt. Cottrell ran to bridge keeper Welling's booth, where there was a phone and called Mulsoff's Barber Shop (John Mulsoff is the town barber and chief of police) to warn about the shark. However, Mulsoff doesn't believe him and thinks it's just a prank stemming from the attacks along the shore. Capt. Cottrell got in a boat to warn a group of boys heading toward the creek, but he missed both Lester's group of friends and another group of boys swimming in the creek. He then ran up Main Street shouting the warning. Around the same time, a motorboat of teen boys also saw the shark near the drawbridge. The boys in the boat were 18-year-olds Harold Conover, Ralph Gall, and John Tassini.